The homeowners' stone bird bath is repurposed and has found a new home in the upper level conifer/zen garden. Flanked by three 'Mr. Bowling Ball' arborvitae that are planted into the gravel seating area, it's an unexpected focal point. Photo by Jay Sifford. Thanks - Thanks for your prompt response. You answered my question. Much appreciated. Those are 'Mr. Bowling Ball' arborvitae. In enough sun, they "bronze out" for the winter. Hope this helps. Arborvitaes. The arborvitae is another member of the cypress family and a useful tool in creating artistic textural gardens. Like the Chamaecyparis, it generally exhibits flat, textural fern-like foliage. While we generally picture the taller pyramidal arborvitaes that are commonly used for hedges, there are several dwarf and rounded forms available. Mr. Bowling Ball (Thuja occidentalis ‘Bobozam’, zones 3 to 7) and Little Giant (Thuja occidentalis ‘Little Giant’, zones 3 to 8) are two suggested cultivars.The three Mr. Bowling Ball arborvitaes shown here play off the textural stone birdbath and take on a sculptural quality, planted unexpectedly in a gravel seating area. Arborvitaes. The arborvitae is another member of the cypress family and a useful tool in creating artistic textural gardens. Like the Chamaecyparis, it generally exhibits flat, textural fern-like foliage. While we generally picture the taller pyramidal arborvitaes that are commonly used for hedges, there are several dwarf and rounded forms available. Mr. Bowling Ball (Thuja occidentalis ‘Bobozam’, zones 3 to 8) and Little Giant (Thuja occidentalis ‘Little Giant’, zones 3 to 8) are two suggested cultivars. The three Mr. 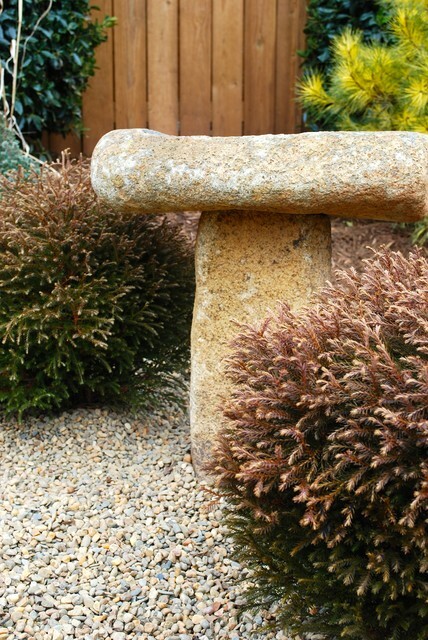 Bowling Ball arborvitaes shown here play off the textural stone birdbath and take on a sculptural quality, planted unexpectedly in a gravel seating area.